What is the Canon Rebel T5i? What Makes the Canon Rebel T5i Unique? The Canon EOS Rebel T5i is Canon’s latest addition to its amateur-oriented Rebel series, a line of Canon cameras meant for photographers who are just beginning their journey. At a relatively affordable price ranging from $450 to $500 on Amazon, this entry-level DSLR is the new flagship of the Rebel line. It is also a solid choice for any novice photographers looking to upgrade their gear without breaking the bank due to its ease of use, strong specs and powerful performance. 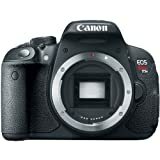 The Canon Rebel T5i is an entry-level DSLR and an upgrade to the EOS Rebel T4i. It is considered the “step-up” model from the T5, less of a dramatic upgrade and more of a refresh. However, if you own an older Canon Rebel model, be aware that the Canon Rebel T5i features many improvements over the T2i and T3i. It can shoot at an ISO up to 12800 in manual modes, it can shoot up to 5 frames per second in burst mode, and it has an updated processor which gives it more speed. It also has a variety of scene mode options that enhance auto-mode shooting, as well as touchscreen capabilities, all of which is very helpful for getting a novice photographer accustomed to their new camera. Now that the Rebel T5i is a bit older, it should be available at attractive prices, making it a great option for those searching for a superior entry-level DSLR camera. The Canon Rebel T5i has extremely fast performance when in Viewfinder mode and excellent image quality in all shooting situations, whether low-light, natural light, action or still shots. It can shoot in both RAW and JPEG formats. Its high-resolution LCD not only features touchscreen but is articulated, part of its excellence as a well-built camera. The DIGIC 5 processor​, Canon’s latest processor model, gives the Canon Rebel T5i great performance when shooting photos. The T5i also has great response times when it comes to using the optical viewfinder and shooting in Viewfinder mode. There are almost no shot-to-shot delays or shutter lag, and the burst mode features 5 frames-per-second at full 18-megapixel resolution. Start-up and autofocus are also very fast. The Hybrid CMOS AF system​ makes shooting photos and video in Live View a pleasure. This hybrid system combines two separate auto-focus technologies, phase and contrast detection AF, for a faster and more accurate focus. These dual complementary AF systems work in conjunction with pixels on the camera’s CMOS sensor to help predict subject location, which is especially helpful with continuous focus tracking in video recording while also improving focusing speed. Finally, if you shoot mostly in Viewfinder mode, the battery life is adequate. You can also add a battery grip if needed for more power. Also, Canon has provided a high-performance kit lens with the T5i which definitely adds value to the camera kit overall. The 18-55mm Image Stabilizer kit lens uses Canon’s STM Stepper Motor technology to create quieter operation during video capture. 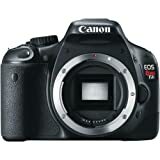 The Canon EOS Rebel T5i has outstanding image quality courtesy of its APS-C sized CMOS image sensor, which produces sharp, 18-megapixel images with bright and accurate colors. Special effect filters are also included with this camera, which allows you to shoot with effects such as black and white or miniature. The camera is particularly good at producing high-quality images even in low-light, and noise in RAW images isn’t a problem until you hit the highest ISO settings. A pop-up flash is included with the T5i, but you can also add a more powerful external flash if you desire for better results. Improvements have been made to the CMOS sensor, AF sensor, and flip-out dot screen in order to entice customers into choosing this entry-level DSLR over any other. High image quality is no longer enough for consumers who require quick and easy access to video recording, a must for any aspiring YouTuber. For users more comfortable using an LCD screen than a viewfinder, Live View performance is critical. The Canon Rebel T5i aims to improve its Live View and video performance options, including the ability to have continuous AF tracking while recording movies. Continuous AF tracking is enabled by Canon’s Hybrid CMOS sensor, which uses pixels dedicated to phase detection autofocus. The Hybrid AF system uses the pixels to set the lens to about the correct distance, then uses contrast detection AF to fine-tune focus. This is supposed to provide faster and more reliable focusing for Live View and video shooting compared to other Canon models. The Rebel T5i also features a contact-sensitive touchscreen that functions like a typical smartphone. In Live View and Movie modes, users can touch the screen to specify where the focus should be as well as release the shutter. The touchscreen also supports multi-touch and gestures similar to the iPhone. As for the rear screen, it has been redesigned in order to reduce reflections and improve visibility in bright light. It also features an anti-smudge coating to minimize fingerprints and keep the display bright and clear. Canon’s DIGIC 5 processor allows it to shoot at a maximum ISO sensitivity of 12,800 (25,600 extended). The processor allows lens-specific corrections during JPEG processing. The AF system for eye-level shooting uses nine cross-type focus points, and the center point offers additional accuracy when used with fast lenses. The Canon Rebel T5i has a built-in stereo microphone which provides sound for video, though it also retains an external microphone input. Several modes such as ‘HDR Backlight’ and ‘Handheld Night Scene’ combine different exposures for appealing, unique final processed images. ‘HDR Backlight,’ for example, ensures that backlit subjects are not recorded too darkly by shooting three consecutive shots at different exposures and then combining the images in order to maintain detail in both shadow and highlight areas. The body design is the same as the EOS 600D and EOS 700D, with a useful set of external controls and a fully-articulated LCD screen. The articulated LCD is especially helpful for photographers interested in self-portraiture or hoping to use a tripod with the camera. While the body may be made of plastic, it’s plenty solid and you won’t hear any flexing or creaking. The body features a slightly-enlarged grip which is much improved from older models in the line. At the top, there is an embossed and easy-to-read 360-degree dial with standard settings as well as enhanced and scene modes. To navigate these settings, you use the horizontal scroll wheel on top and the Q button at the back. 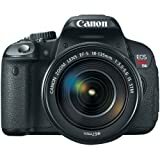 While this is an entry-level model, the Canon Rebel T5i features many control points and a full range of connectors, from USB and HDMI ports to a receiver for an infrared remote control. The camera’s mode dial gives shooters access to many different scene modes which allow the user to quickly and easily shoot sports, landscapes and more. The dial also helps you switch between automatic, program, aperture priority and other shooting modes. The number of scene modes will help photographers for whom this camera marks their first real upgrade feel much more comfortable. The menus are detailed but still intuitive without being as intimidating as a professional-level camera. The main controls are located on top of the camera. As for the articulating LCD touchscreen, it’s great for Live View, working off a tripod and shooting videos. Unlike tilt-only screens, it can still be used to shoot stills in portrait format whether at waist level or overhead. The touch-sensitive screen features large, well-positioned icons that make it easy to adjust shooting settings, swipe through and zoom image playback, and even navigate the whole menu system. This is a standout feature from Canon. Not only does the T5i offer an onscreen version of every external control, the touchscreen interface is integrated seamlessly with the camera’s hardware dials and buttons. You also have the option of turning it off completely. The T5i’s excellent image quality and sharp, articulating rear LCD screen are some of its most appealing qualities, as is the way Canon has married the camera’s touch capability to its physical controls. The viewfinder, however, is not as large and bright as the pentaprism viewfinder found in (for example) the Pentax K-S2, so if you’re looking for a more versatile body, the EOS 60D, 7D or full-frame 6D may be your best bet. The video autofocus is smooth and fast but you’ll need to use a special lens in order to take advantage, so you might want to use another camera instead. The Sony Alpha 65 is a good bet because it has fast autofocus and transitions seamlessly when shooting between the rear LCD and finder. The Nikon D5200 gives the Canon EOS Rebel T5i stiff competition even though it too has a difficult optical viewfinder. While the body is sturdy and well made, some photographers may find it bulky, in which case the Canon Rebel SL1 may be a suitable replacement. It is much smaller than the T5i but includes many of the same features with only slight compromise. The Canon EOS Rebel T5i is pretty much the same camera as its predecessor, which is good news since it’s still a very solid camera. Even on factory settings, the Canon EOS Rebel T5i produces beautiful, sharp photos filled with color and detail. With its image stabilization, lens focusing, several shooting modes and other Canon technology, Canon has made it easy for the amateur photographer to understand this camera and its settings, learn how to adjust everything manually, and produce great work. The Feature Guide, which displays a short description in each shooting mode, during mode dial operations and for Quick Control screen functions, is especially helpful in this regard. The Canon EOS Rebel T5i is particularly well-suited for video. The articulating display is extremely helpful when capturing video and stills at any angle desired. The camera can auto-focus while recording, and the external microphone jack captures audio as well. Its ease of use and bevy of powerful features make the T5i a good choice for those looking to take the plunge from a point-and-shoot to their first compact DSLR, especially if video is in the picture. The Canon EOS Rebel T5i has a sensor that captures images with exceptional clarity. It is supported by DIGIC 5 Image Processor that works with the camera's CMOS sensor to deliver images with incredible detail without the need for artificial light sources. It can shoot up to 5.0 frames per second, continuously thanks to the enhanced shutter mechanism. Overall, we are giving this featured product a rating of 4.4 stars out of 5 stars.